I’ve been using Neato Botvac robot vacuums in my home for several years now and can’t imagine going back to manually sweeping the floors in my home. Having a robot to do my bidding on a set schedule is awesome. It means I don’t have to drag out the vacuum several times a week and it means I can come home to a clean home (at least the floors) every day. The only “bad” thing about robot vacuums is that a human (me) has to empty the dirt bins every few days into the trash can. This isn’t a hard thing to do, but it’s kind of gross when the dirt and dust fall into the trash can and a cloud of dirt billows upward towards my face. I always try to hold my breath so I won’t breathe it. I’m happy to report that the days of manually cleaning your robot vac’s dirt bin are almost over. 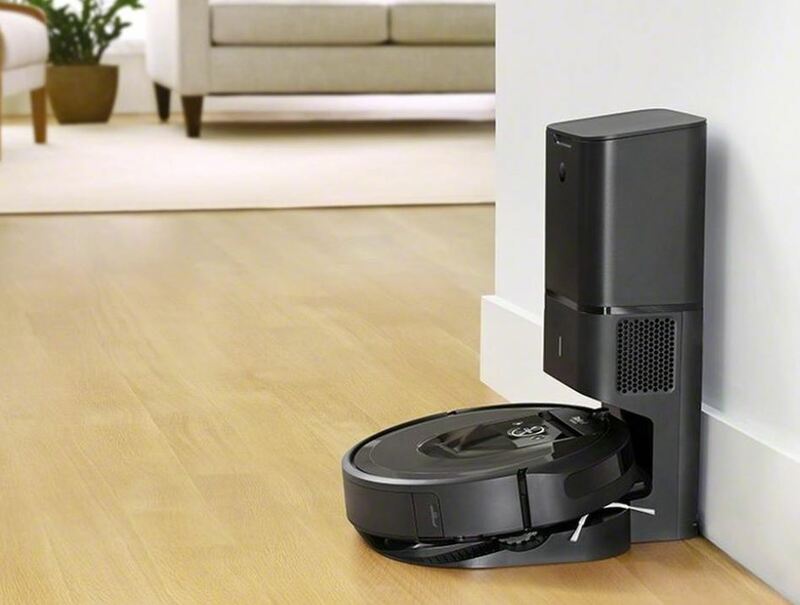 The geniuses over at iRobot have created the new Roomba i7+ robot vacuum that can empty its own dirt bin. No, I’m not kidding! The i7+ works with a new charging base that has a built-in receptacle that can hold up to 30 days worth of collected debris. Now when the Roomba i7+ finishes a cleaning session, it will go back to the Clean Base where the crud in the dirt bin is sucked into a bag in the Clean Base. When the bag is full, an app on your phone will notify you so you can replace it. The only downside to this robo awesomeness is that you’ll have to buy specialized dirt disposal bags for the Clean Base. The price for the bags is $15 for a pack of 3. Ugh. But that’s 3 months worth of bags and 3 months of not holding your breath while emptying dirt in a trash can, so the price doesn’t seem too bad. Yes, I know, expensive solutions for first world problems. If you’re excited about the new Roomba i7+, start saving your pennies because it’s going to set you back almost a grand at $949.99. The Roomba i7+ will be available on 9/12 and you can head over to irobot.com to pre-order now. Excellent. I use a two year old Roomba – plus a house keeper and always hated the “unload”. Not impressed, I said many years ago these things should have a dock that integrates with a central vac. Wat is the point of a robot if you have to constantly clean it. I have a Neato. Just emptying the bin is not enough, you also have to shake out (or replace) the filter and clean hair from the brush every once in a while. I kind of doubt that the self-emptying docking station is going to solve all of that. I’ve owned an i7 now for about 2 weeks. iRobot started selling them direct ahead of public availability. Quite simply it rocks! Besides the self-emptying, they somehow made it very significantly quieter than previous models. My previous model – a 980 so not very long ago – sounded like a blow-dryer running around the house for 90 minutes. This thing I still go check on because there are times I can’t hear it running from the next room. Quite amazing. And it better be for the price!